There’s a story behind every story, as they say. Here’s how an intended bearing360 .ca blog post ended up morphing into a front page story in the Toronto Star. Here’s the overall thing I found striking: The TSB wasn’t just sitting back, issuing reports. It was taking to social media to apply pressure. So, again. Why? One way to interpret that decision is it just wants to fulfill its mandate and make transportation in Canada safer. Another interpretation is that the TSB was growing exasperated with the amount of time it was taking Transport Canada to implement changes that the TSB recommended. I know enough about human nature to know that no one likes not to matter, and there is no reason to think the TSB would be happy with simply issuing recommendations and not seeing a payoff in the form of safer travel. At the very least both questions deserved an exploration. So about a week late, with some time available, I started in on the story. I contacted TSB media relations official John Cottreau, who was kind enough to set up an interview with one of their senior aviation investigators and subject matter experts, Mark Clitsome. Mark confirmed and echoed the concerns expressed in the tweet and video, that the TSB was concerned about the number of overruns in Canada and had been for some time. He didn’t say explicitly that the TSB was frustrated with Transport Canada — it’s not his job to start a battle with Transport Canada — but he did say that the runway overrun issue had been on the TSB’s watch list for some time and concern was growing. It’s easy enough to connect the dots and infer frustration with the pace of change. I then started in on the research, looking for documentation about the state of runway overruns in Canada and what Transport Canada was doing to remedy. If you’re a journalist today, the web makes things so much easier than it was before documents were available online. I also armed myself with current international runway standards. The International Civil Aviation Organization (ICAO) governs international rules on air travel. 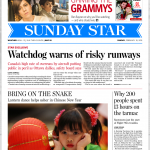 The TSB had said to be on the phone that Canada was not in compliance with ICAO rules on runways. Hmm. Why? What is the status of proposed runway regulatory revisions? Are they in force or no? Are revisions to TP312 complete. If not, what is their status? Why, in the opinion of TC, have overruns not significantly decreased since 2010? Why does Canada not require airports to be in compliance with ICAO standard? I received an immediate reply but was informed there would be an undetermined wait for the answers. I expected this. Government agencies will spend a great deal of time and energy shaping their message so as cause the least amount of harm to the agency and its political master. Every few days I’d check in to find out what the status was of my query. After nearly three weeks I was beginning to think an answer wasn’t going to come, so I politely informed TC that I was going ahead with a story anyway and would be happy to include their response when they were able. My thinking was I’d fall back on that journalistic maxim: Go with what you have and fill in later if you can. My contact at TC appreciated the heads up and said she’d do what she could. To my surprise, a couple of days later, just as I was about to post a story on bearing360,ca, I got a response. Some questions had been answered and some hadn’t. It was clear to me, however, that I had a story. The concerns raised by the TSB were still being addressed, Canada was not in compliance with international standards, and it would be some time before a policy change would take place. At this stage I realized I had a story that a newspaper would likely find worthy. 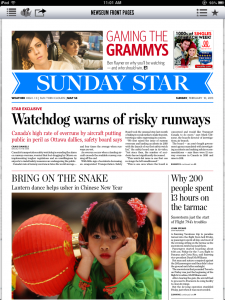 Not only was there a news peg — that Canada lagged in runway safety standards and unsafe incidents were higher than the world average — but aviation stories generate quick interest among editors and readership because when something goes wrong with an airplane, the outcome is often ugly. Runway overruns, in particular, are a hot-button issue in Canada with the 2005 episode at Toronto’s Pearson International, when an Air France jet ran off the runway in wet weather and burned — precisely the scenario of growing concern stated by the TSB in its video. It also stood to reason that because of this episode, there was pressure on Transport Canada to take action. So I wrote a story and then contacted a former Globe and Mail colleague who, as luck would have it, happened to now be the national editor at the Star. I pitched the story in a short, bright, couple of paragraphs. He was immediately interested. We worked out freelance payment terms and I filed the story. A day later he wrote and asked if there was any reason he couldn’t hold the story and put it on A1 (front) for Sunday. I said no reason whatsoever. I knew from my days working as the front-page editor at the Globe and Mail what he was thinking: Weekend papers, specifically the news cycle of Saturday-to-Sunday and Sunday-for-Monday, can be slow. Offices are closed, government departments closed, so it’s difficult to generate news. My story happened to have a not-bad news peg and it could sit for a few days without undo harm. In other words, it was perfect for a weekend paper. Low-and-behold, it showed up on front. I got the much-appreciated heads up of its publication on Sunday morning from the aerial photographer for whom I work as a pilot. Something entirely appropriate about that, I thought. I then spent the following day building a follow-up package for bearing360.ca based on the Star story. My days as deputy sports editor at the Globe taught me the value of packages. They’re a way to stoke interest and flesh out an issue. This blog post is part of that package. You can find my related side-bar here. This entry was posted in Airports, Industry News & Commentary, Safety and tagged front page, journalism, overruns, runways, Star, Transport Canada, Transportation Safety Board, TSB on February 11, 2013 by Craig Daniels. Why, in Transport Canada’s view, runways overruns have not decreased since 2010. Why it was taking so long to introduce changes to policy. Transport Canada said it is “collaborating with industry stakeholders to discuss approaches to RESA at Canadian airports,” however it declined to say what the status was of those collaborations. If it was within Transport Canada’s authority to simply mandate that airports install ICAO-standard runway end safety area (RESA). In the absence of answers, it’s worth speculation and discussion. I exchanged some observations with an airport operator over the weekend and he pointed out that there is resistance at airports to install runway end safety areas and engineered material arresting systems (EMAS) because of lack of space and cost. Understandable. No doubt this is behind the delays in implementing change in policy. The conundrum faced by Transport Canada is how to achieve compliance without downloading financial hardship on airports. If a given airport were unable to comply due to lack of money and was forced to close because it was not in compliance, the outrage from people and communities who depend on that airport would no doubt be considerable — and the government would feel the full brunt of that outrage. However, the airports at which improved RESA and EMAS facilities are most required are the larger airports with the most number of aircraft movements: Toronto, Montreal and Vancouver prime among them. These airports primarily handle the larger aircraft which require longer runways and these airports are far better able to absorb the costs because their landing fee revenue is so much higher than smaller facilities. What needs to happen, of course, is that the federal government, in the name of meeting the recommendations of the Transportation Safety Board, should authorize the release of funds in conjunction with Public Works in the form of infrastructure projects. Jobs would be created and public safety improved. Transport Canada would then be free to make its runway policy changes quickly and effectively and enhanced safety would be the payoff. This entry was posted in Airports, Industry News & Commentary and tagged overruns, runway, Transport Canada, Transportation Safety Board, TSB on February 11, 2013 by Craig Daniels.